★12X Zoom lens transforms your phone into an instant telephoto camera lens, overcoming the limitation of smartphones, which help you take superior quality photos like a pro. ★Fisheye Lens provides you incredible and dramatic rounded images, which takes you into the stunning and fantastic world. ★Macro Lens helps you focus your subject for extremely detailed close-ups of textures and objects. ★Wide Angle Lens helps you to take photo of large ranges, which is a perfect lens for capturing travel scenery, breathtaking landscapes photos or selfies. It's better to take off your phone case for taking better photos. Please put your cell-phone camera in the center of the lens at first. The Macro Len and the Wide Angle Len are attached together while you receive them. When using the macro lens, please keep 1-3 inches distance from the subject to focus for clear photo. [Four Amazing Lenses in One Kit] Amazing 4-in-1 Professional HD Photo Lens Kit includes four cell phone camera lenses to make your photography look like professional. Come with 12X zoom telephoto lens, fisheye lens, wide angle lens and macro lens, which meet all of your demand. [Excellent Performance] 12x zoom lens is specially designed for mobile photography, helping you to bring subject closer in your photo and capture details from a distance. Fisheye Lens provides you incredible and dramatic rounded images. Macro Lens helps you focus your subject for extremely detailed close-ups of textures and objects. Wide Angle Lens helps you to take photo of large ranges. 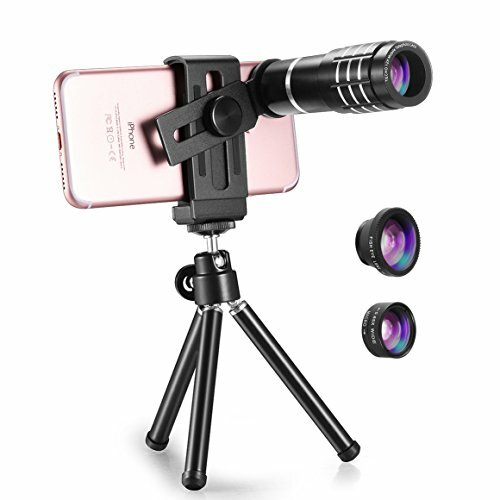 [Removable Monocular Telescope] The 12X zoom telephoto lens can be used as a standalone telescope, providing a bright and clear range of view up to 1000 yards away. Good for sporting events, concerts, bird watching, camping, fishing, golf, scope and travelling. [Universal and Easy] Universal design fits all mobile phones, great photo lens for iPhone 7 Plus / 6s / 6s plus / SE, Samsung Galaxy S8 / S8 Plus / S7 Edge / S6, iPad, Samsung Tablet and other smartphones. Please kindly note when using on iPhone 7 Plus, please aim the lens at the left lens of the iPhone 7 Plus and DO NOT use the zoom or portrait model of the camera. [Stylish Design] Made of aluminum alloy and with black layer circled around, providing TECHO lens a much more professional high-end look, which will be a great gift to photographers.